Europe District Cooling Market size in 2017 was valued over USD 35 billion and the annual energy consumption will reach over 13,000 TJ by 2024. Ongoing adoption of sustainable technologies coupled with increasing government measures to reduce carbon emission will foster the Europe district cooling market share. Rising demand for space cooling across the region will stimulate the industry growth. In 2016, the EU introduced (COM (2016) 51 final) initiative with an aim to reduce energy imports & dependency across the member nations. Further, it also proposes plan toward the decarbonization of buildings and reducing GHG emissions emitted from commercial and residential establishments. Extreme climatic conditions with relatively high temperatures across the Eastern and Central regions will stimulate the Europe district cooling market share. The average increase in surface temperature on account of global warming will accelerate the industry growth. As per European Environment Agency, the annual mean temperature across the Central and Eastern Europe is anticipated to increase between 1 to 30 C by the end of century. Free cooling technology in 2017, accounted for over 14% of the Europe district cooling market share. The technology adoption is influenced by reduced carbon emissions owing to the increasing penetration of renewable energy, decrease in peak power consumption and reduced need for infrastructural upgradation. Ongoing development of projects by utilizing sea or lake water with an aim to reduce GHG emissions will foster the product development. In May 2016, Fortum opened a new DC system in Tartu, Estonia with an aim to provide cooling to downtown areas in the most natural and efficient way. Absorption cooling technology is set to witness growth owing to its environment friendly nature and ability to utilize waste energy for production purpose. Increasing demand for energy efficient cooling systems favored by high environmental standards will foster the industry growth. Reduced fuel & electricity requirement and decline in emissions are some of the prominent features which will propel the Europe district cooling market share. Residential district cooling market is projected to grow over 2% by 2024. Ongoing deployment of government assisted sustainable establishments along with increasing adoption of small scale DC systems will foster the industry growth. For instance, in 2016, AEB and Westport Warmte initiated a project in Amsterdam to construct DC plants for space cooling across the residential buildings. 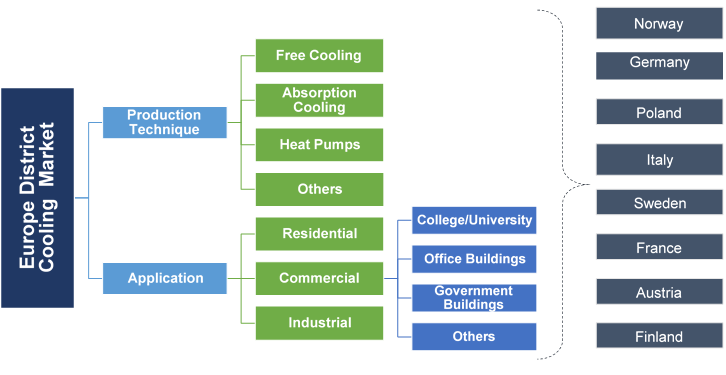 The commercial district cooling market is set to grow on account of increasing investments toward development of efficient and sustainable technologies across the sector. Introduction of strict government norms toward sustainable building solutions will further propel the industry growth. The Germany commercial real-estate investments accounted for USD 32.24 billion in 2017, reporting an increase of over 35% when compared with 2016. Italy district cooling market is projected to grow over 2% by 2024. Accelerating temperature across the cities along with ongoing government reforms toward energy efficient and sustainable residential and commercial establishments will foster the business outlook. The average temperature range in Rome was recorded between 80 C to 260 C in 2016. Ongoing deployment of renewable energy technologies along with stringent government norms pertaining to decarbonization of buildings will drive the Germany district cooling market. Increasing investments toward sustainable building solutions coupled with numerous government initiatives will further propel the industry growth. The government of Germany in 2016, announced an investment of USD 19.4 billion toward the development of energy efficient technologies in next five years. Sweden district cooling market will grow on account of increasing adoption of sustainable energy technologies along with stringent government norms toward emissions. Further, the torrid climatic conditions owing to its geographical location near Gulf stream will also fuel the industry growth. In 2016, the average temperature in Stockholm during summer seasons was 22.40 C.
Eminent industry players catering across the Europe district cooling market includes Logstor, Ramboll, Veolia, Vattenfall, Fortum, Goteborg Energi, Helen, Wien Energi, Siemens, Alfa Laval and Engie. 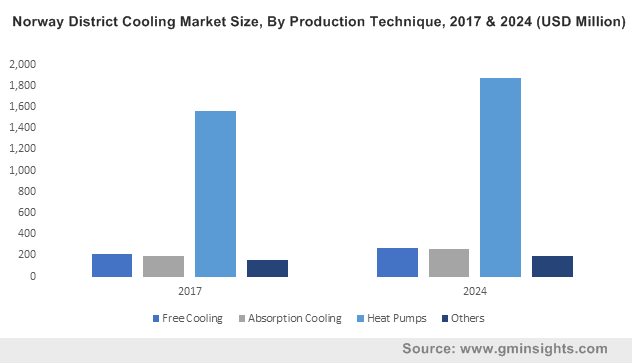 Increasing investments toward research and development coupled with various initiatives to increase the presence has been a prominent strategic inference by major industry players across the Europe district cooling market. Further the shifting focus toward the development and customization of product and expansion of existing facilities to cater the increasing consumer base has been a focus point for key industry players. District cooling systems delivers chilled water from a centralized plant to buildings through a network of pre-insulated pipes for process and space cooling. The power required to drive the technology is produced from various sources including absorption cooling, heat pumps, compressed chillers and free cooling. The products consume less power when compared with alternate technologies, are easy to maintain, efficiently controls the internal temperature of establishments and produces low noise.